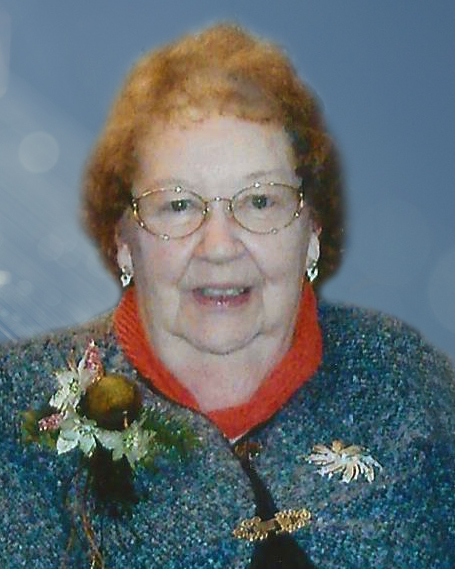 Obituary for Betty Jane M. Plaza-Machel | Peterson Kraemer Funeral Homes & Crematory Inc.
Betty Jane M. Plaza-Machel, aged 92, passed away during a restful sleep while surrounded by her family on November 2, 2018, in Wausau after an illness. She was preceded in death by her first husband Walter, her son Rodney, her parents and siblings, and her sons-in-law, Jack Corvino and Mark Wojan. She is survived by her husband Emil (Bud) Machel, her children Sandra (Dennis) Stern, Phyllis Corvino, Sue (Mike) Barnes, James (Barb) Plaza, Shelley Wojan, and Kevin (Lorie) Plaza, grandchildren, great-grandchildren, and great-great-grandchildren. Betty Jane was born at home at Wausau on December 30, 1925. Betty Jane married her first love Walter M. Plaza on March 6, 1948 in Wausau, and her later life love Emil (Bud) Machel on June 25, 1994 in Wausau. Known for a kind story, a quick wit, innumerable recipes, and a loving lap for grandchildren, great-grandchildren, and great-great-grandchildren, Betty Jane will be missed by all that knew her and memories of her life will be cherished. She was surrounded by an ocean of love. Funeral services will be 11:00 a.m. Thursday, November 8, 2018 at Zion Lutheran Church, Wausau. Burial will be in Restlawn Memorial Park, Wausau. Visitation will be Thursday from 9:30 a.m. until the time of services all at Zion Lutheran Church, Wausau.